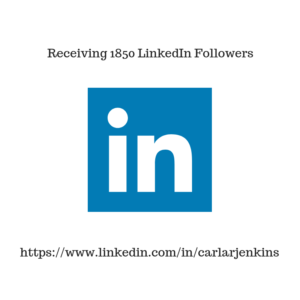 Very happy to receive 1850 LinkedIn followers. I am very happy to receive more people from all walks of life. My new followers are not confined only to project management and entrepreneurs. This means that my reach and audience are expanding which is good. I feel that these new followers are a result from my planning and process series. Many people outside of entrepreneurship and project management need planning and process creation. I view these new followers as an opportunity to learn more. Watch My Thank You Video Below!